AT&T notified some of its customers yesterday that it had detected attempts to hack into their servers and obtain customer account information, although America's second biggest mobile carrier was quick to point out that no accounts were breached. "We recently detected what could have been an organized attempt to obtain information on a number of customer accounts," AT&T spokesman Mark Siegel said in a statement to Cnet. "The people in question appear to have used autoscript technology to determine whether AT&T telephone numbers were linked to online AT&T accounts." The company stated it has sent an email to those affected, but pointed out at the same time that less than one percent of the company's users were at risk. While one percent might sound a small figure that equates to potentially one million affected users going by its reported 100.7-million wireless subscribers at the end of the third quarter. "Our investigation is ongoing to determine the source or intent of the attempt to gather this information," Siegel said. "In the meantime, out of an abundance of caution, we are advising the account holders involved." Those that were contacted have been advised to be very cautious of any emails or text messages they may get because there "may be an increased risk of fraudulent attempts to access" account information. It is vital all subscribers remain vigilant in either case though, as it is uncommon for any service provider to request personal or financial information via those methods. AT&T remained tight lipped about the finer details of the incident, but it's likely the hackers were aiming to gain access to customer information to use to steal credit card information from those affected in future phishing attacks. 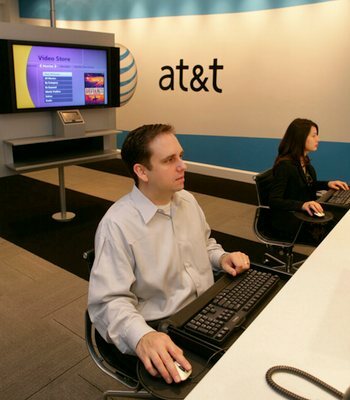 Had they gained access to customer account numbers, personal information and the phone numbers of subscribers, it could have been easier to trick users into believing they were AT&T. This incident closely follows the intrusion at a Illinois-based water utility last week where hackers gained access to the pumps control system, operating a pump by turning it on and off until it burnt out.